Comments: As adminstress and chief aide to Commerce Guild President Shu Mai, Cat Miin oversees the distribution of raw materials to the Separatist Droid Army. She accompanies Shu Mai when the council is instructed to go to Mustafar and await the arrival of Darth Sidious’ new apprentice, Darth Vader. 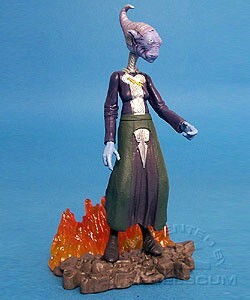 Cat Miin is a repaint of the Shu Mai figure that was included in 2003's Geonosian War Room II SAGA Screen Scene.